James Muir Cameron Fletcher was born on December 25, 1914 at St Clair, Dunedin. Following the rapid expansion of the construction business founded by his father in 1909, the family moved, first to Wellington in 1919 where James attended primary school, then back to Dunedin in 1925. He attended Waitaki Boys' High School for two years and then after 1927, Auckland Grammar School, after the family moved north. 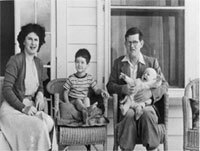 On leaving school in 1931 James Fletcher qualified as an accountant (ACA) and joined the South British Insurance Company Ltd in Auckland. In 1937 he left to accompany his parents on a trip to visit building and manufacturing industries in Scandinavia and England. It was this experience that provided the impetus for James Fletcher’s decision in 1937 to join the family business - as a junior accountant. Fletcher Construction became a public company in 1940 and at the age of 25 James Fletcher became company secretary of Fletcher Holdings. In 1942, when he was appointed Managing Director, Fletcher Holdings had approximately 300 employees and an annual turnover was £2.2 million ($4.4 million). In the same year he married Vaughan Gunthorp, an employee of the company with a background in accounting and who was her future husband’s personal assistant. They were to have three sons. Vaughan and James Fletcher and sons Jim, and Hugh, Christmas 1947. 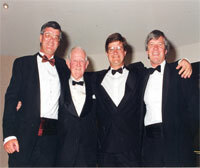 Sir James Fletcher's retirement function from the Board of Fletcher Challenge with sons- Jim, Angus and Hugh 1990. During the war years Jim Fletcher, as he always referred to himself, or JC, as he was known, had moved the company in a more manufacturing-based direction. Fletcher Holdings’ turnover had steadily increased and the time had come for his father to effect a transition of power in favour of the son who was clearly already the company’s driving force. In 1947 JC made the first of many trips to the USA, Vaughan acting as unpaid secretary, to tour plywood factories and sawmilling companies. Such international business connections were influential in James Fletcher’s moves towards the establishment of the company he himself named Tasman Pulp and Paper, and which owed its existence above all to his vision and tenacity. After some years of intense negotiation, in 1953 work on what was then the world’s fourth largest paper mill began as did the creation of the town of Kawerau, built by Fletcher Construction to Ministry of Works design. 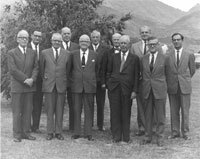 Tasman Pulp & Paper Board of Directors at Kawerau (J.C. Fletcher 2nd from right with his father Sir James Fletcher 3rd from left front row). Circa 1959. Also in the 1950s, James Fletcher and Fletcher Holdings Limited had a leading role in the establishment of New Zealand's first steel mill, Pacific Steel. Sir James Fletcher was Chairman of Pacific Steel from 1962 until 1987. In 1972 he was appointed Chairman as well as Managing Director of Fletcher Holdings Limited. 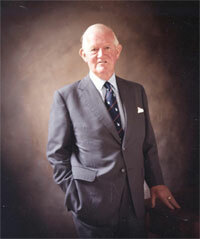 He was succeeded by his son, Hugh, as Managing Director in 1980 but remained Chairman. 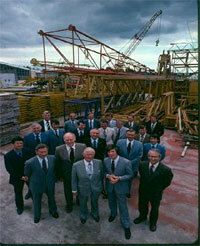 Sir James Fletcher and staff from Pacific Steel Ltd 1981. James Fletcher was knighted in 1980 for services to industry and the community. He was also Chairman of Pacific Steel Limited, Marac Holdings Limited, British Petroleum (NZ) Ltd, Forest Investments Ltd and Lusteroid Holdings (NZ) Limited and Deputy Chairman of Tasman Pulp and Paper Company Limited and South British Insurance Company Limited. His directorships included Australian Newsprint Mills Holdings Limited, Auckland and Intercontinental Properties Limited, Dalgety (NZ) Limited, Alcan (NZ) Limited, Nylex (NZ) Limited and Hikurangi Forest Farms Limited. He was also a member of Lloyd's Register of Shipping, New Zealand Committee. Sir James Fletcher receiving knighthood from Governor General Sir Keith Holyoake 1980. 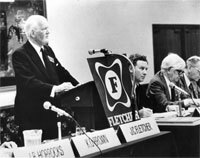 J.C. Fletcher addressing shareholders at his last Annual general Meeting as Managing Director of Fletcher Holdings Ltd 1979. Following the merger of Challenge Corporation Limited, Fletcher Holdings Limited and Tasman Pulp & Paper Company Ltd he was named President of the new company, Fletcher Challenge Limited, in January 1981. Sir James remained President until his retirement from the board of directors in November 1990, having reached the age of 75. Sir James Fletcher was a former president of The Auckland Racing Club and Auckland Chairman of the New Zealand Blood-stock Breeders Association. From 1934 he was a keen member of the Pakuranga Hunt where he achieved a reputation as an intrepid huntsman. His friend and colleague George Fraser once described him as “a fearless rider and a frequent faller” and commented that a Monday following a hunt was never a good day to try to win an argument. Sir James Fletcher was Vice President of the Auckland division of the NZ Cancer Society and a member of its executive for many years. J.C. Fletcher in front at the Pakuranga Hunt 1947. 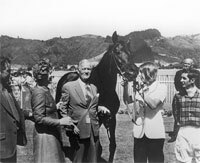 J.C. Fletcher & Vaughan Fletcher at the Wellington Cup presentation won by "Rustler" 1973. His keen personal interest in New Zealand art came as the result of the establishment in 1962 of the Fletcher Collection under the guidance of Sir James and George Fraser. They purchased not as an investment but for the edification and interest of staff, whose personal tastes he and Lady Fletcher either challenged or indulged when re-hanging paintings in offices. For many years they were a familiar sight at art auctions, annotated catalogues at the ready. Recognised as well informed and spirited bidders, they were always prepared to ‘have another go’ when unexpected rivals were encountered. The Fletcher Trust Collection today owes both its size and quality to Sir James’s determination that it should represent the whole scope of New Zealand painting and that only the finest works should be considered for purchase. 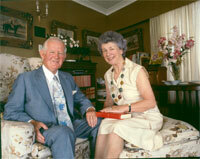 Lady Fletcher and Sir James Fletcher in Fletcher Challenge House. 1990. Sir James Fletcher brought to his 53 years of business practice in New Zealand an international vision. He travelled widely, meeting many business leaders. He recognised what New Zealand’s natural resources provided for the country and worked hard and long at their development. His first major international project had been the expansion of Auckland’s wharves in 1950. He brought two leading U.S. construction companies into a partnership with Fletcher’s, which saw new methods and a forward-looking approach applied to the largest port development in New Zealand. More so than any other industrialist, he successfully concluded a series of joint ventures with large overseas companies. 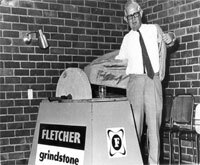 James Fletcher was the strategist behind the important Fletcher company changes and expansion from the 1940s onwards. He was always an enthusiastic advocate of the Fletcher Group’s participation in projects that furthered national development. Thus the company was involved in the establishment of many new industries in New Zealand – including particleboard, ready mix concrete, linseed and rapeseed oil extraction, long run roofing, wire drawing and galvanising. 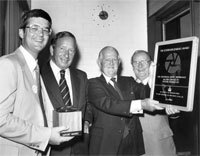 Sir James Fletcher (3rd from left) with son J.R. (Jim) Fletcher with Governor General Sir David Beattie and Trade Minister Lance Adams-Schneider with Export Award in 1981. Official opening of the Gladstone Plywood Factory - Prime Minister, K. Holyoake, J.C. Fletcher (Managing Director, Fletcher Holdings) T.C.B Cooper, Director & South Island General Manager 1965. James Fletcher pioneered welfare schemes such as the wholly subsidised superannuation scheme for construction workers and introduced a medical scheme for employees, before medical insurance was begun. Many employees could testify to his interest in and care for their welfare. In 1997 Sir James Fletcher was the recipient of The Order of New Zealand for services to business and in the same year was inducted into the New Zealand Business Hall of Fame. He continued his involvement with the company through his chairmanship of The Fletcher Trust which has, from its inception in 1976, given support to a diverse range of national, regional and community based programmes such as the Young Enterprise Scheme. Sir James was founder trustee of the ‘Business in the Community Charitable Trust’, and a Director in ‘Business in the Community Limited’, both fully owned by the charitable trust. Lady and Sir James Fletcher visiting the Life Education Trust Mobile Classroom, Rotorua, funded by the Fletcher Challenge Trust in June 1992. Since the year 2000, by which time he was 86, Sir James Fletcher’s activities were gradually curtailed. He attended fewer company functions though was always a welcome guest on anniversary occasions. He continued to act as chairman of the Fletcher Trust, his interest in its art collection based on a conviction that it was everybody’s right to be able to experience and enjoy the best work produced by New Zealand artists. He had extraordinary recall of the many significant events in which he had taken part and, perhaps unusually for such a naturally shy man, became a skilful raconteur, with a store of amusing anecdotes. With his lifelong modesty he would have been surprised to know of the many people who held him in great affection. Despite so many significant achievements during a long life Sir James Fletcher remained to the end the antithesis of the ruthless businessman. Sir James is survived by his wife Vaughan, two sons, Hugh and Angus, the eldest, Jim, having died tragically in 1993, seven grandchildren and six great grandchildren.